Students learn about civil engineers and work through each step of the engineering design process in two mini-activities that prepare them for a culminating challenge to design and build the tallest straw tower possible, given limited time and resources. First they examine the profiles of the tallest 20 towers in the world. Then in the first mini-activity (one-straw tall tower), student pairs each design a way to keep one straw upright with the least amount of tape and fewest additional straws. In the second mini-activity (no "fishing pole"), the pairs determine the most number of straws possible to construct a vertical straw tower before it bends at 45 degrees—resembling a fishing pole shape. Students learn that the taller a structure, the more tendency it has to topple over. In the culminating challenge (tallest straw tower), student pairs apply what they have learned and follow the steps of the engineering design process to create the tallest possible model tower within time, material and building constraints, mirroring the real-world engineering experience of designing solutions within constraints. Three worksheets are provided, for each of two levels, grades K-2 and grades 3-5. The activity scales up to school-wide, district or regional competition scale. A student makes a straw tower within time and material constraints. Engineers apply science and mathematics concepts to solve problems that improve the built world, including the design of buildings, bridges and other structures. As civil engineers design structures, they work through a cyclical process called the engineering design process to ensure that the structures are well-tested and designed within given constraints (such as a budget, limited construction materials and deadlines) and meet the specifications (such as size, weight, length, strength and environmental considerations). During this activity, student teams act as civil engineers to design and build model straw towers, taking into consideration limited materials, time and rules as they brainstorm, design, build and improve their structures. List two engineering limits/constraints faced during the activity. Draw/describe two or three examples of structures designed by civil engineers. Designs can be conveyed through sketches, drawings, or physical models. These representations are useful in communicating ideas for a problem's solutions to other people. Basic knowledge of the engineering design process and how to use a ruler or tape measure. Figure 1. The Petronas Towers in Kuala Lumpur, Malaysia, have 88 floors and are 452 meters (1,483 feet) high. Do engineers build the first things that pop into their minds? Do you think civil engineers immediately built the Petronas Towers once the idea popped in to their minds? Raise your hands, if you think "Yes, engineers build the first thing that pops into their minds!" (Wait for raised hands.) Well, usually we draft and then check our work many times before we finally get a good final version. Engineers do the same; they draft and then carefully re-examine their work before they are able to finally solve important problems. Engineers are also concerned about quality and safety. Would you take the elevator up into the Petronas Towers if it did not seem like it was well-built—which means it was not drafted, tested and checked many times? Of course not! Engineers do not just build the first things that pop into their minds. They work through a cyclical process called the engineering design process to make sure they create well-tested structures that meet all their needs and constraints. Today, you will act as if you are civil engineers with an important mission. You will work through the steps of the engineering design process with constraints—just like the civil engineers who designed the Petronas Towers! Your challenge is to build the tallest straw tower possible using only 50 straws and one meter of tape in 30 minutes. But first, let's practice using the engineering design process with two mini-activities to get us ready for the big challenge. The problems you will face in this activity are like the real-world challenges that civil engineers and other engineers face. You have a goal with certain requirements and constraints, just like engineers have limited money, construction materials and deadlines. An engineering team that can achieve its goal with as little material and money by the deadline is favored over other teams. When you and your partner are brainstorming your straw tower design, think about these requirements and constraints. Think about real buildings, towers, bridges and skyscrapers—what shapes are they? What are their bases like? How are they connected? Gather materials and make copies of the Tower Masters Research Worksheet (Gr3-5), Straw Tower Mini-Activities 1 & 2 Worksheet (Gr3-5) and Tower to the Moon Main Activity Worksheet (Gr3-5), one each per student. For younger students, use the grades K-2 versions of these worksheets, provided in the Attachment section. Make copies of the Competition Rules, one per team. Decide how to best make available the Tallest 20 in 2020 poster so students can compare the profile images of tall towers—a large poster, smaller handouts or projected in the classroom. For each group, prepare two piles of straws, one with 15 straws and one with 35 straws, for a total of 50 straws. For each group, measure and cut three lengths of masking tape—1 m, 0.5 m and 5 cm—for a total of 1.55 meters. Recap: Begin by informing students about engineers, civil engineers and the engineering design process. Then student pairs conduct research by examining a poster showing 20 of the tallest buildings in the world and share their observations with the class. Then students learn the steps of the engineering design process before moving on to the mini-activities. Conduct the pre-activity assessment activities, as described in the Assessment section. Hand out the research worksheets, one per student. Review the following information with students while they complete the worksheets (by cutting and pasting on the grades K-2 worksheet or by answering questions on the grades 3-5 worksheet). Explain to the class: In order to complete your engineering challenge to design and construct the tallest tower possible using only 50 disposable drinking straws and 1 meter of tape in 30 minutes, you need some knowledge and tools! In the real-world, engineers apply their understanding of math and science to create things to help solve problems that benefit people and our world. In particular, it is civil engineers who design our buildings as well as bridges, dams and other public structures. Tell the students: Now that you know a little about engineers and, specifically, civil engineers, you are going to work with a partner and put on your civil engineering caps to investigate and identify the common design features found in the world's tallest towers. Divide the class into groups of two students each. 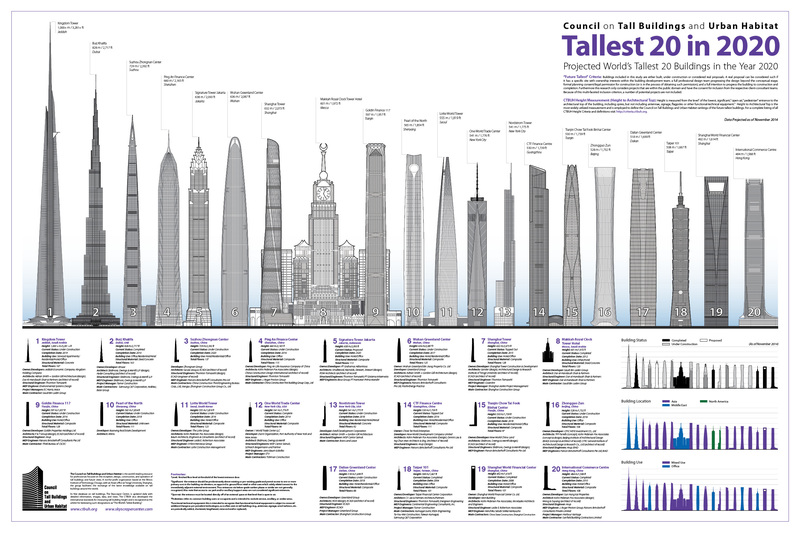 Provide the class with a visual of the CTBUH's Tallest 20 in 2020 poster, which includes side-view drawings and information about 20 "supertall" and "megatall" buildings located in 15 cities around the world. Give teams three minutes to examine the poster, discuss and jot down their observations of the common design features of the tallest towers. What features might make it possible for them to stand without falling over? Comparing the tallest buildings in the world, what features do they have in common? Tell the students: Now you have some knowledge about features to consider when you design your straw towers, but remember that engineers do not just build the first thing they think of, or else it would waste materials, time and money! Engineers use the engineering design process to help them design their structures so they achieve successful solutions. As a class, go over each step of the engineering design process as listed on the research worksheet. Write each step on the classroom board so that students can follow along (by either cutting and pasting/taping or writing the steps on their worksheet circle diagrams. The basic steps are: 1) ask: identify needs and constraints, 2) research the problem, 3) imagine: develop possible solutions, 4) plan: select a promising solution, 5) create: build a prototype, 6) test and evaluate prototype, 7) improve: redesign as needed. Explain to the class: Let's put this process into action with a mini-activity. You will work through the steps of the engineering design process in this mini-activity called "one-straw tall tower. As you work through the mini-activity, follow along on your worksheets, filling them out as you go. Tell the students: In this mini-activity, you and your partner need to design a way to keep one straw upright by using the fewest number of additional straws and no more than 5 cm of tape. Ask: "What is the next step in the engineering design process?" (Answer: Research the problem.) We have already done some research to compare and contrast features between tall and shorter towers. Ask: What is the third step in the engineering design process?" (Answer: Imagine: Develop possible solutions.) For a few minutes, you are going to individually brainstorm solutions to this mini engineering challenge to keep one straw upright with the fewest number of additional straws and up to 5 cm of tape. Draw and label your ideas, indicating how many additional straws you need. Give students five minutes to brainstorm. Make sure each group has 15 straws and 5 cm of tape. After five minutes, tell the students: Before you touch the materials, tell me the next step in the engineering design process. (Answer: Plan: Select a promising solution.) That's right. Before you touch the materials, discuss and decide with your partner the most promising plan to build. On your worksheets, indicate which plan you are selecting, and then built it! Give students five minutes to build. Give groups an opportunity to brainstorm a new and improved design ideas based on their results, observations and reflection. Then have student groups build their revised designs. Wrap up by asking students to reflect on the steps of the engineering design process they just completed: create: build a prototype, test and evaluate the prototype; improve: redesign as needed. Make sure students still have their mini-activities worksheets. Give each group 15 straws. Tell the class: Now you have some knowledge about common tall tower features and you have constructed a one-straw tower following the steps of the engineering design process. Why can't we just build a really tall straw pole as a straw tower? What do you think will happen if we made the one-straw tall towers taller—just a straight tall rectangle tower? (Answer: The structure would be at great risk for collapse. If students are unable to answer the question, use the following prompts/hints. What can happen to tall trees on a windy day? Tell the students: Since you are working on an important challenge to build the tallest tower, you need to do some hands-on research to find out how many straws high you can build before a straw pole looks less like a tower and more like a fishing pole when held upright, bending at about 45 degrees. Let's take a few minutes for you and your partner to make the tallest straw pole possible by experimenting with your 15 straws. (Not all 15 straws need be used.) Then write on your worksheet the number of straws you were able to use to make a straw pole before it started to bend and look like a "fishing pole." Give students five minutes to experiment and build. Remind them to follow along on the worksheets, filling them out as they go. Direct the students to discuss with their partners why they think the straws create a "fishing pole" with X+ straws (expect the number of straws to vary, depending on the exact straw type used). Encourage students to discuss as a class why they think the straw pole started to look like a "fishing pole" when more straws were added and how one can build and maintain a tall, stable structure. Write down answers together as a class. Reintroduce the culminating activity: Now it's time to put everything together! After these two mini-activities, you know all about successful tall tower design features and how to use the engineering design process to design and redesign to achieve the tallest straw tower to complete your challenge! Remember, your goal is to build the tallest tower possible; maybe your tower will even reach the moon! You are going to design and construct a model tower that represents your tower to the moon. Your team will be given limited supplies and time: 50 plastic drinking straws, 1 meter of masking tape and 30 minutes. Build the tallest tower that you can using only the provided materials. Clarify some new building constraints, as described in the competition rules handout: In addition, your tower must be free-standing, which means that it can only touch the flat surface that you build it on. Any straw touching the flat surface may be taped to the surface, but the tape may not be used as "rope" or to reinforce the straws outside of any straw-straw joints. Another restriction is that the straws may not be cut. You may bend the straws or fit them inside each other, but they may not be cut! You are not required to use all 50 straws. In fact, if two towers tie for the highest height, the one using the fewest straws is the winner—so keep that in mind! Ask: Before we start the timer, let's review our activity's needs and constraints. What is our need (requirement) for this design challenge? (Answer: To build the tallest straw tower.) What are our constraints?" (Answer: Materials and time in the form of 50 straws, 1 meter of tape and 30 minutes, and the competition rules.) Now take a few minutes individually draw and label how you plan to construct your straw towers. For five minutes, let students individually design and draw their plans on their worksheets. Give teams 30 minutes to discuss, select and build their best structure designs. Tell the students: Before you and your partner touch the materials, listen to these instructions. You have 30 minutes to discuss and select the best plan, noting it on your worksheets and then constructing that design. During these 30 minutes, you may redesign or change your straw tower as you see fit to improve it. I will give you 15-, 10-, 5-, 3-, and 1-minute warnings so you always know how much more time you have. You may start discussing and building now! With a wider base, you might be able to build a taller tower. Think about how the tall towers are more triangular shaped. Some of the towers we compared and contrasted had an antenna or spire on the top! After 30 minutes, measure and record the height of each group's tower and determine which is the tallest. Measure tower height vertically from the flat surface to the highest part of the straw tower. For younger students, measure and record the height of each group's tower as a class and write the measurements on the classroom board. For older students, let them measure and record the heights of each group's tower on their worksheets either with their partners or as a class. After students have measured and recorded the heights of all the towers, give them 15 minutes to redesign and construct improved towers, incorporating what they learned from their own towers and observations of other groups' towers. Since some masking tape will be reusable, only provide each pair with an additional 0.5 meter of tape. Make final measurements and announce the group with the tallest tower. In case of a tie, the tower that used the fewest number of straws wins. Conclude with the post-assessment activities, as described in the Assessment section. civil engineer: A person who designs structures of all kinds, including public works such as bridges, tunnels, highways, dams, skyscrapers and all sorts of buildings. constraint: In engineering design, the limitations and requirements/needs that must be considered when designing a workable solution to a problem or challenge. design: To form or conceive an idea, new product or improved process. To make drawings, sketches or plans for the work. engineer: A person who applies his or her understanding of science and mathematics to creating things to solve problems that benefit humanity and our world. model: A representation of something, sometimes on a smaller scale. To make or construct something to help visualize or learn about something else. Research Worksheet: During the introduction and research portion of the activity, have students individually complete the Tower Masters Research Worksheet (Gr3-5) as they learn background information about engineers, civil engineers and the engineering design process, and look for common features of skyscrapers. Review their answers to gauge their engagement and comprehension. For younger students, use the grades K-2 version of this worksheet, provided in the Attachments section. Activity Worksheets: Have students individually complete the Straw Tower Mini-Activities 1 & 2 Worksheet (Gr3-5) and Tower to the Moon Main Activity Worksheet (Gr3-5). Review their answers along the way to gauge their depth of comprehension. For younger students, use the grades K-2 versions of these worksheets, provided in the Attachments section. Re-Engineering: On their main activity worksheets, have students draw and label improvements they intend to make to their straw tower designs (or could make, in the case of younger students using the grades K-2 version of the worksheet). Have students research or read more about the Petronas Towers. Have students research examples of tall towers and skyscrapers in their own cities and states. The two sets of provided worksheet versions provide scaling for kindergarten to second grade, and third to fifth grade, respectively. For higher grades, incorporate explanations about how the shift in the center of mass causes the taller straw towers to topple over more easily. As a tower gets taller, its center of mass moves farther from the base, so it has less support and topples over more easily if it is not built with sound engineering design! During the Introduction/Motivation section, show students a photograph of the Petronas Towers at https://pixabay.com/en/light-moon-kuala-lumpur-klcc-tower-169704/ (same as Figure 1). Many thanks to Jean Vandergheynst, Alisa Lee, Travis Smith, and all the University of California Davis RESOURCE Fellows and activity reviewers for providing feedback, support and guidance to make this activity possible.